but also preserves the life of your record player, preserves the record's fantastic sound quality and continues to provide beauty. 1. Place the record onto platter and switch on power. Hold the aluminium housing of the brush (not the handle) and place it gently onto the vinyl record. 2. Allow the record to spin 1~2 times. Move the brush from the inside groove to the outer, trying not to lose any of the collected particles. 3. After completing cleaning, rotate the brush handle over the brush fibers to clean away collected dust and dirt. 4. Rotate the brush handle to the storage position to keep the carbon fibers protected. 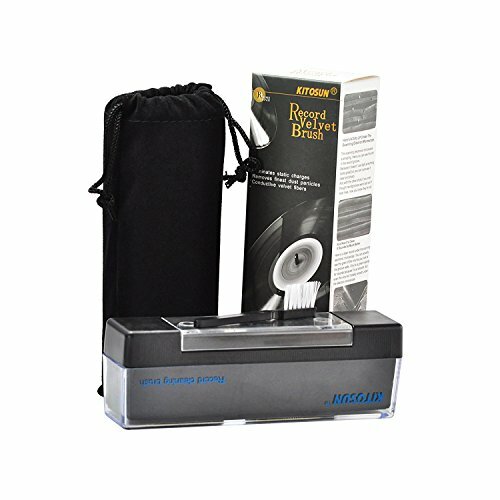 【2 in 1 Vinyl Record Cleaner Unique Design】 This 2 in 1 record brush is made by the soft velvet ,can gently remove the dust on the record and keep away from scratching,another small cleaner brush is designed to clean the stylus, the clear plastic cover can store the two brushes and keep clean from dust. 【Gentle And Non-toxic Velvet】Record Brush material is a safe soft,and environmentally friendly formula, non-toxic substances velvet ,no harm to the record player.The velvet is very soft and smooth and works well to remove any fluff, lint or any other debris from your vinyl. please rest assured to use. 【Save Sound Quality Of Record】Regular cleaning can increase the life of vinyl and stylus。Use the record brush to remove stains and dust on the LP record, reduce the friction on the record, preserve the original sound quality of the record. 【Easy To Store And Carry】We provide a nice and very soft flannel pouch , you can easily store it or carry with you anywhere.Never worry it will get lost or dirty. 【Perfect Gift For Audiophile】The Record Brush Set makes a great present for any audiophile and fits any occasion to provide you with a wonderful auditory experience ! If you have any questions about this product by KITOSUN, contact us by completing and submitting the form below. If you are looking for a specif part number, please include it with your message.